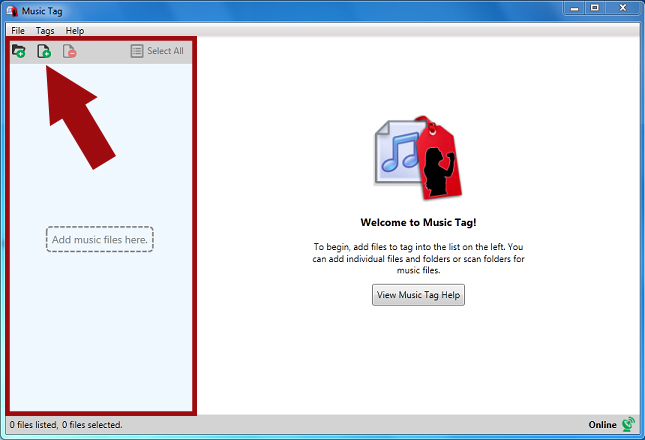 Download the Music Tag Manual. The file list holds all the files added to Music Tag, and allows you to save, revert, delete and add files to it. Due to all the functionality built in to it, this page details how to accomplish certain tasks, to make usage simple. You can press the Add File button and add files through the browse window that will be displayed. You can press the Add Folder button and use the menu to select a folder containing music. Or you can drag and drop files and/or folders onto the list on the left side. This will add them to the list, and make them available for use in the program. You can press the Remove File button to remove the files from the list. This will not save any changes, so please make sure you've saved any changes you want to keep. All these functions can also be accessed in the context menu on the list, by right-clicking, and on the menu, under "File". If you wish to select all the entries on the list, you can do so by pressing the Select All button.